If you've been following along on social media you might remember that the lovely people at Bratz sent us one of their dolls for Ruby to get to know. We've been taking her everywhere on our travels and posting pics on social media of our Summer antics and Ruby has loved having her along for the ride. 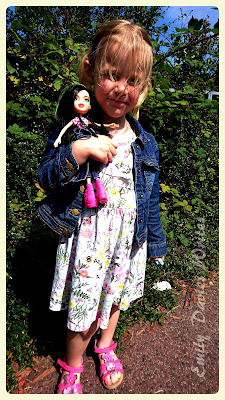 Now, first of all, we are just embarking on a world of girly fun with Ruby, who is three and a half*, so this was our first encounter with the Bratz brand. I love the idea of having dolls who are slightly 'cooler' than your average tall, skinny, blonde doll, but I wanted to know they were still age appropriate and not overly sexualised. But, I needn't have worried. Our new friend, Jade, was dressed in dungarees and a t-shirt - the type of clothes Ruby herself would wear. She came with some headphones, a hair brush and a mobile phone. This couldn't have been more appropriate because Ruby LOVES listening to music on my phone so I think she could relate really well to Jade. Part of me wanted to jump on the internet and get Ruby a pair of matching yellow headphones! (I resisted). During the course of the summer Jade has come out with us everywhere. Granted, our adventures haven't been particularly exotic but we took her to the park, blackberry picking, for coffee, to church, for picnics and even to the dentist! There was one incident where she nearly got left on the bus - cue Mummy running back down the street to the bus stop and rugby tackling a driver who had picked her up! Thankfully it was the end of the route. She has provided bags of entertainment for Ruby and is the perfect size for taking out (ever been lumbered with a much-loved huge teddy bear who your child insisted on taking with them to the shops? Me too). I love that her clothes and shoes are removable and I guess if you built up quite a collection then hours of fun would be had with wardrobe changes. But for now, Ruby was perfectly happy to brush her hair, put her on her shoulders and troop about with her everywhere. She's even started talking to her as if she's a part of the family! Anyway, needless to say I was suitably impressed by the doll. She seemed sturdy, well made - her hair didn't fall out like cheaper imitations tend to - I liked her casual style, and that Ruby related to her. It might be an odd thing to say as well but I liked that she came already named. Ruby has other dolls but she's not quite able to assign them proper names and I think this hinders her ability to relate to them and play with them in a meaningful way. Whereas Jade was already named and so she was immediately Ruby's new friend and was referred to as such. I would now consider buying Ruby a few more Bratz dolls when she's a bit older, assuming that their style suited Ruby and that they were equally as cool. I like that the brand encourages creativity and originality in fashion rather than cookie cutter style (we can't all look like a certain all-american blonde equivalent). According to the website Jade is a confident trendsetter and I'd like to think that Ruby might grow up to be a bit like that too! All in all, Ruby loves Jade who is now a firm part of the family. I very much doubt that her affection will wain just because our #SummerofBratz is over! 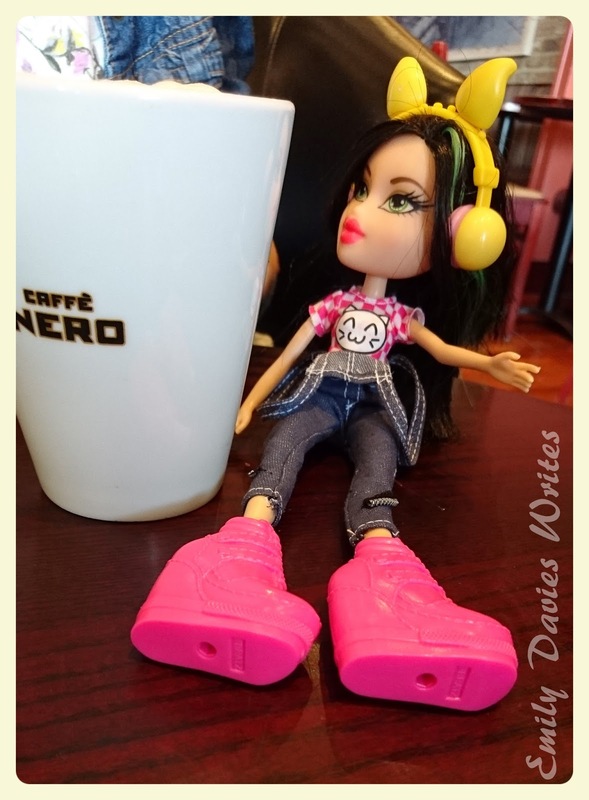 You can find out more about the range at the Bratz website but be sure to head onto social media and search #SummerofBratz to see what other Bratz dolls have been up to! (*It's worth mentioning that the packaging does recommend Bratz dolls for age 5+ so Ruby is slightly younger than their target market). 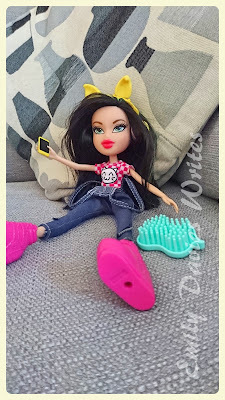 We were gifted Jade by the lovely people at Bratz for the purposes of this review, however all the opinions are my own (or Ruby's! ), 'cause, you know, I wouldn't lie to you!